The first thing to remember is that you’re visiting a rainforest. It will, by definition, be wet all year round! That said, there is still a marked difference between the dry and rainy seasons. The weather is generally drier and hotter between May and August, and again from December to February. During March and April, and again from September to November you can expect more frequent and heavier rain showers. Muddy roads and paths can become tricky to handle. The advantages to visiting in dry season are less muddy paths, easier hiking and clearer views of the wildlife. The disadvantage is that this is peak tracking season and therefore permit availability is lower. You’ll need to book well in advance. Aside from more choice in permit and accommodation availability, there are some other pros to visiting during rainy season -- not least that smaller group sizes allow a more intimate tracking experience. Temperatures are fixed year round between 21°C (70 F) and 30°C (86 F), dropping to 10°C (50 F) at higher altitudes. Although chilly at night, the exertion of hiking and climbing will keep you warm during the day. In Rwanda and Uganda, the price of gorilla permits remains the same throughout the year. (Uganda used to offer discounted permits, but no longer does). The annual Kwita Izina gorilla-naming ceremony takes place every September and offers a fascinating insight into Rwandan culture and the country’s efforts to promote gorilla conservation. The event is free to attend, but by invitation only. A good tour operator will be able to arrange access for you. Your day of gorilla tracking will be long, active and at least fairly arduous. You’ll be hiking in thick forest in a changeable climate. Evenings can be cold, mornings are cool and the days are hot -- especially when you’re clambering up a muddy mountainside. A small backpack to carry water, packed lunch and rain jacket. Walking boots or hiking shoes. Boots are ideal for the extra ankle support on rocky and muddy terrain. Long socks will allow you to tuck in your hiking trousers and protect your ankles from scratches and biting insects. Higher-end lodges may loan gaiters to guests. Hiking pants or waterproof trousers (handy when sliding down muddy slopes!) Do not plan on wearing jeans or shorts. Hiking in wet jeans is a misery and shorts will leave you exposed to scratches and hungry insects. A long-sleeved shirt offers much needed protection from the sun and insects. A fleece or light-wool sweater for cold mornings. Cheap gardening gloves will protect your hands but aren’t essential. Walking poles if required. Upmarket lodges will provide poles. In Rwanda your guide can cut you a custom-made pole from bamboo! At least one litre of drinking water and your packed lunch. A basic first aid kit may come in handy: antiseptic wipes, anti-histamine cream, insect repellent, plasters, painkillers, malaria prophylaxis and rehydration sachets. Gorilla tracking is physically demanding and you should be well prepared, physically and mentally. Having the right equipment will make a big difference to your enjoyment of the experience. Hiring a porter is highly recommended and you will be grateful for the support. At a minimum, be prepared to be on your feet for five hours. If you are fit and are assigned to a remote gorilla family you may be hiking the entire day. The day starts early and you may have been travelling the day before. Remember that you will be at altitude and will tire more easily. If you suffer from any kind of breathing difficulty, consult your doctor before booking your trip and remember to bring your medication. Age should not be a deterrent and it’s common for people in their 70s and above to enjoy gorilla tracking. The rangers and porters have many years' experience helping visitors move through the forest. In Uganda, enterprising locals offer sedan-type chairs for carrying elderly or disabled visitors through the forest. This comes at a steep price, so consider this for emergencies only. With common sense and a reasonable level of fitness your day will be memorable for all the right reasons. Your hour with the gorillas will fly by and you’ll certainly want some good photos as a memento. If you get lucky you’ll find your gorilla family on a sunny day out in the open in perfect conditions. But depending on your location and season it is likely to be fairly dark and gloomy under low-lying mist and dense forest canopy. As the name suggests, Uganda’s Bwindi Impenetrable Forest can be dense and dark. In Rwanda, the less dense bamboo vegetation usually makes for better photographs. You may be on the move with the gorillas, so it’s best to get organised and think about your photos in advance. Once you meet the gorillas, get your photos out of the way so you can spend plenty of time out from behind the camera lens. Flash photography is strictly prohibited. You’ll need to disable the automatic flash and any focusing lights. If you have a film camera, take fast film (400-1600 ASA). Experienced photographers recommend shooting at ISO 1250 or above in the forest. Serious photographers will probably bring more than one camera body as changing lenses while the gorillas (and you) are moving around can be difficult. Take a zoom lens, wide angle lens and a fixed focal length lens. Professional filmmakers will need to apply for filming permits in advance from the Uganda Wildlife Authority or the Rwanda Development Board. Am I guaranteed to see the gorillas? Although buying a gorilla tracking permit does not guarantee a sighting, the rangers know what they’re doing and there is a 95% success rate. The gorillas are well monitored and their general whereabouts are always known. 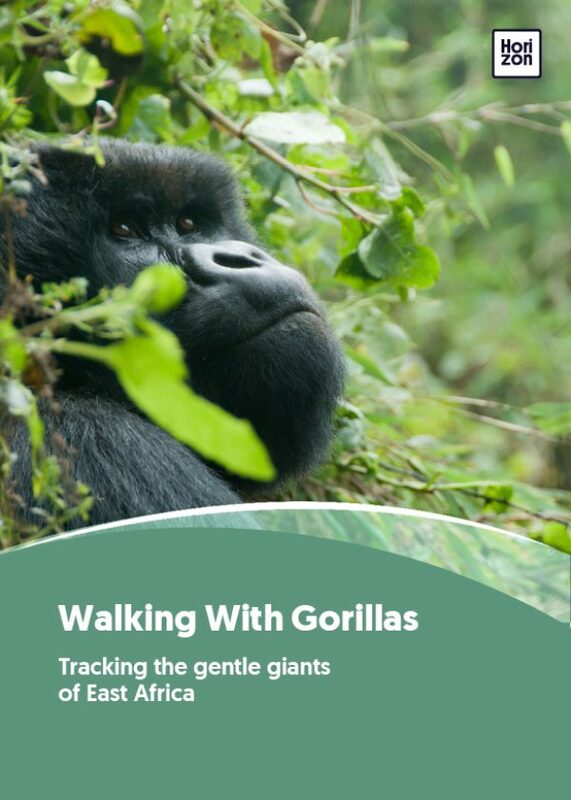 On the rare occasions that visitors track the entire day and do not encounter the gorillas, a percentage of the permit fee is refunded: 75% in Uganda and 50% in Rwanda. Can I exchange or sell my gorilla tracking permits? Permits are non-transferable. They are non-refundable except for medical reasons, in which case a medical certificate will be required. What happens if I am sick on the day of my gorilla tracking? According to the tracking rules visitors showing signs of illness are not allowed to track the gorillas. Visitors should present themselves at park headquarters where the situation can be assessed by the warden in charge. 50% of the tracking fee may be refunded at the warden’s discretion. How many days should I allow for my gorilla tracking trip? Most visitors stay for two nights. If you have little time it is, in theory, possible to see the gorillas in Rwanda in just one day. But you are strongly recommended to spend at least two or three days. The altitude and exertion of the climb can be unpleasant when rushed. There is also a wealth of things to see and do aside from tracking the gorillas. Take some time to explore the country, its culture and its people. Will I need a porter? Hiring a porter to help with your gear not only makes the climb more pleasant, it also supports the local community and therefore the habitat and the gorillas themselves. Your porter will carry all your camera equipment and rain gear, as well as your snacks and water. The porters and rangers provide invaluable assistance every step of the way. It costs just $10-15 (plus a discretionary tip of $5) to hire a porter for the day. How much should I tip the Gorilla tracking rangers and porters? Allow a tip of $15-20 per tracker/ranger. Tips should be in small US dollar bills (dated post-2006) or local currency (Rwanda francs or Uganda shillings). It’s a good idea to have your tip for the porters ready as you descend the mountain as you might part company before you get back to the park headquarters.